-Center section and shaft replacement. -Investigate adding a driveshaft loop. -Fabricate an adapter to relocate the shifter lever. Right now it sits forward about 1"-2" so I will fabricate an adapter to move the lever back slightly. I want it to be center in the hole. A plate with four holes should be enough. Based on this list I am hoping to drive the car early next Spring as soon as the snow is gone and the salt is cleared off the road. The list is more doable than last winter's list. Last winter list ended up taking a whole year. At least I am happy I was able to drive the car 80 miles so I can work in the fine tuning over the winter. 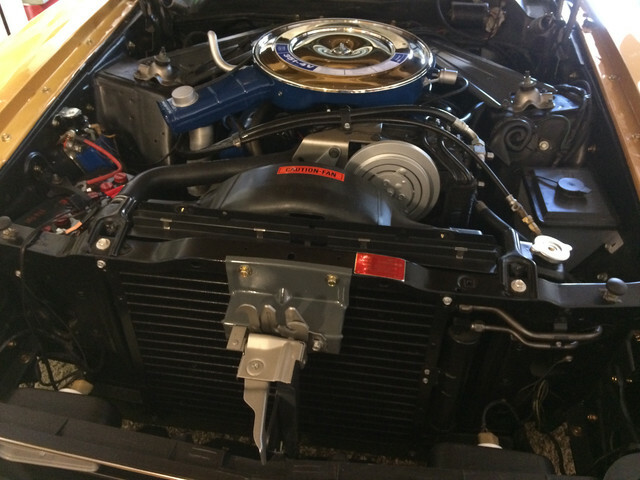 I never posted a picture of the engine in the car. So here is how it looks w/o the air filter. Also absent is the wiper fluid reservoir. Something else I need to take care is to seal the gaps between the radiator and shroud on the sides (not seen in picture), and the gap between the radiator and support. Anyone has a good idea on how to cover the gap between the engine and A/C radiators. I also have a gap between the fan shroud and radiator on the vertical edge on the driver's side. My thought is to get a sheet of plastic/rubber and cut it to fit. However, I am afraid it may not look too good. Also, another question. 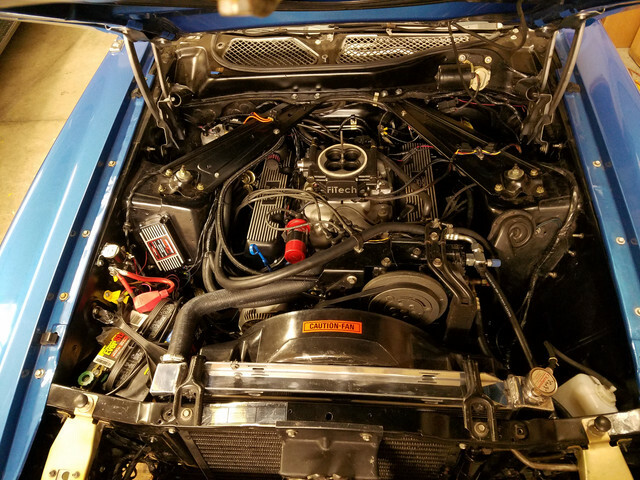 As you see this picture of my engine bay, do you think the coil would look better in black, Ford blue or another color besides red? Cars with A/C originally came from the factory with a plastic piece that clipped on the radiator to fill that gap. They are now reproduced and many of the vendors sell them. See pic below from my 72 Q code. What is that piece call? or can you send me a link? Thank you. I found the old piece from my car. Since my radiator is thicker I needed to modify it. Now that gap at the top is taken care of. The next gap is at the vertical edges of the shroud. I have not been keeping up with my thread updates but I can tell you that I have been working in the car slowly. I will update at a later time with details. Edit: ignore post. I went back to the garage after a break and figured out that it was a weak feeder tensioner.... rrrr! In any case, my post today is to complain that my Eastwood mig welder is not working. I used it last about a month ago to weld the snowblower's auger and it worked well. Trust me, the snowblower has seen a lot of use! Today I am all setup to box the rear spring perches until I tried welding. The machine turns on, the fan is on, the wire feeder works, and the gas is exiting. However, the power is like dead. It sparks for an instant, enough to melt a little, but then the spark dies. All this while the feeder is still pushing. That said, it seems like an issue with spark energy. I tested the resistance to the wire and to the ground clamp and it looks good. I tried all kinds of settings (including higher voltage), I tried on a simple and clean piece of steel where the clamp was next to the test spot and the same issue occurred. Any clues?